Traditional carpentry skills using state-of-the-art machinery are watchwords for quality and customer satisfaction at Top Notch Joinery South Western Ltd.
Offering easy parking, the firm's spacious 7,000 sq ft workshops, conveniently situated at Kingsley, Summercourt, near Newquay, is the latest chapter in a business success story that started in a small way in 1986. Partners Bryan Greaves and Jon Brown both worked for a joinery company in St Austell but when they were each faced with redundancy, they took the plunge and opened Top Notch Joinery. 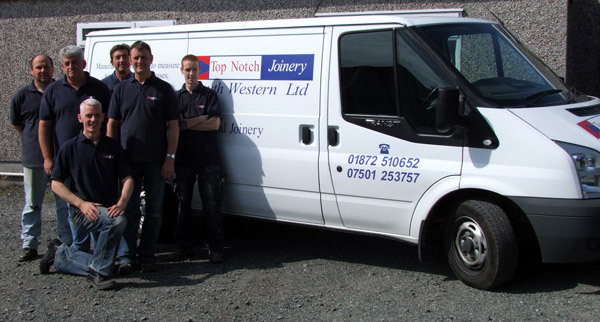 Today, Top Notch Joinery is a thriving enterprise covering all types of purpose-made joinery requirements. Customers are welcome to discuss any design ideas - from new windows to match old, to supplying new conservatories to customers. No job is too big or too small for the Top Notch team. We employ traditional joinery skills and, backed by up to the minute machinery, the best quality job possible is assured and we're more than happy to discuss individual requirements or customer specifications. Every detail is discussed and jobs carried out to the complete satisfaction of our many customers throughout the South West. Copy right © 2014 Top Notch Joinery South Western Ltd .